The flight was really great. We ate dinner, shared a sundae and slept for several hours. Tyson was overall more comfortable this time around, (which we attribute to him getting stronger) however there were a few times that he found himself uncomfortable during the night, so I woke and shifted his legs and hips to make him feel more relaxed. We arrived at Newark at 3:30 a.m., which is 45 minutes before Customs opens, so we had to sit on the plane until then. The United Airline crew takes such good care of us and even remembers us from our previous trip. So, when Tyson’s wheelchair came back from where it had been stowed for the flight with its two sides missing, they were relentless in helping us find them. Very exciting story, I know- but this is our life 🙂 They didn’t end up finding them, however. The fact is, they could still be in Delhi or somewhere on the plane. I filed some paperwork and gave them my contact info if it shows up in India or here. If it doesn’t, they’ll replace it. At least a wheel wasn’t missing, right? Anyway, we are almost home…I am hungry and exhausted and I can’t stop daydreaming about waking Calvin up!! 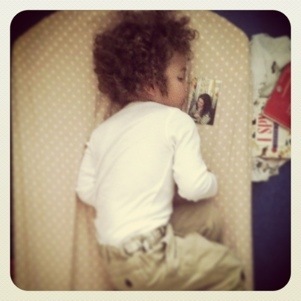 P.s.- this is a picture of Calvin taking a nap at school with a photo of me. His teachers told us that he often talked about mommy and daddy in “Ineya” (India) to get daddy big and strong. He’s such a sweet and strong little 2 year old.